The Persons Farm is nestled in the Flint Hills of the Kansas River valley in southeast Riley County. Lifelong farmer Enoch Persons obtained the property in the late 1850s. He and his family farmed and improved the land for the next five generations. The property includes a grouping of related farm buildings that illustrates the evolution of the farmstead over nearly a half-century. 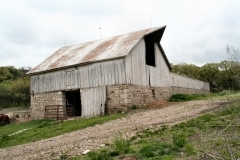 The features include a gable-roof barn made of native limestone and board-and-batten siding that was likely built in the 1860s, a wood-frame granary, with multiple interior grain bins, a corral partially enclosed with six-foot tall limestone walls that date to 1939, and a 1919 clay tile silo with a concrete foundation. The property is nominated for its agricultural and architectural history. 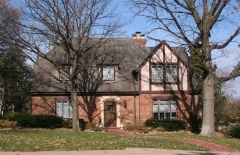 City Park, 405 N 11th St. The Riley County Historical Society, founded in 1914, completed this cabin two years later. 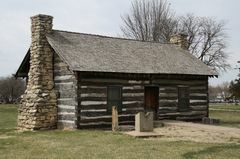 Designed to illustrate living conditions of early Riley County settlers, the Pioneer Log Cabin is a representation of early horizontal log construction techniques featuring hand-hewn logs and joints that were crafted and assembled onsite. Built 60 years after Manhattan’s founding, the Historical Society’s goal with this first museum was to preserve a record of the pioneer way of life. Upon its founding, the Society immediately began capturing sketches of pioneer life from any resident of the county who cared to share and have their memories preserved. Hundreds responded with letters and items. The cabin was built as a home for the archives exhibiting historic memorabilia from the earliest days of the county’s establishment and continues to serve that function today. The cabin served as home to the Historical Society and as their only museum until 1957 when they opened a larger museum. National Register listing is pending. City Park, 1101 Fremont St. Located at the northeastern corner of Manhattan’s City Park, the 1875 Floral Hall was the second such building on the county fairgrounds, replacing an earlier structure destroyed by a storm. 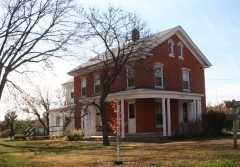 The stone building served as an exhibition hall for the Riley County Fair from 1875 to 1887. After 1888 the county’s annual fairs were held at new fairgrounds outside of Manhattan. 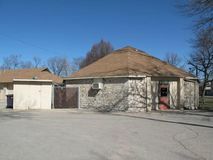 Although the building has been repurposed throughout the decades, Floral Hall is significant for its association with Kansas County Fair heritage; it is also the only extant fair structure in City Park. 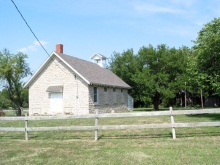 Rocky Ford School is a one-room limestone schoolhouse near Manhattan in Riley County that was built in 1903 and rebuilt in 1927 after a fire. 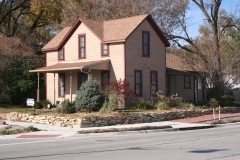 Various repairs and improvements were made to the property within its first two decades. An outhouse was built in 1904, a well was first excavated in 1909, but a new well was dug in 1933, and a merry-go-round was installed in 1929. These contributing elements remain associated with the property. 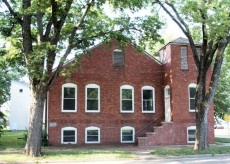 The school building served first through eighth grade students in District 70 until consolidation with District 1 in 1938. Although consolidation had been a topic of discussion during District 70 board meetings as early as 1921, they chose to rebuild the school after a fire nearly destroyed it in 1927. 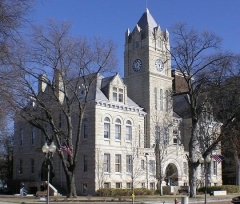 Builder Fred Hulse used the original limestone during the reconstruction and improvements, such as electric lighting, were made. 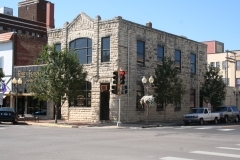 The building is nominated as part of the "Historic Public Schools of Kansas" multiple property nomination for its educational and architectural significance. The Second Baptist Church building is significant for its role in the development of the African American community in Manhattan. It was not only a center for religious worship, but served the greater community by hosting education, social and charitable activities. The original congregation was organized in 1880, a year after the influx of African American refugees arrived in Manhattan as part of the Great Exodus from former Southern slave states. As the congregation grew in size and prominence, its members built this substantial brick building in 1917, replacing the earlier small frame building. It is located on a prominent corner at the intersection of Ninth and Yuma, across from Douglass School and the black U.S.O. Building - both significant community organizations in the historic African American neighborhood.